Summertime is the season for driving vacations. A great way to decide where to go and what to see and do on your road trip is to check out some suggested driving routes. The Hot Springs Circle Route takes you through the Kootenay Rockies region and features numerous hot springs, outdoor adventure and railway history. If you’re a railway buff check out Cranbrook’s Canadian Museum of Rail Travel or the Revelstoke Railway Museum. 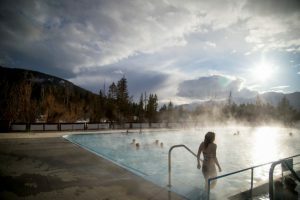 You will find hot springs at Fairmont Hot Springs, and the natural Lussier hot springs nearby, Radium Hot Springs, with one of the largest pools, and Ainsworth Hot Springs, where you can explore a cave that’s part of the hot springs. The town of Golden is situated on the Columbia River, North America’s largest wet land, and features white water rafting on the Kicking Horse River, plus Canada’s highest restaurant, the Eagle’s Eye. Check out the 3 Valley Gap ghost town near Revelstoke, or the SS Moyie, the oldest surviving sternwheeler in the world in Kaslo. Hopefully you brought your bikes to explore some of the trails in the area such as the Galena Trail near New Denver. Take a free ferry across Kootenay Lake from Balfour to the artists’ community of Crawford Bay, and end your circle route by visiting the Creston Valley Wildlife Management Area, a refuge for more than 250 species of birds. The Lakes & Trails Circle Route takes you through Cariboo country with its ranches, lakes, rivers and the history of the gold rush. Start your travels in Kamloops, a bustling city where the North and South Thompson Rivers meet, home to the annual Kamloops Pro Rodeo. Near Cache Creek you’ll find the historical Hat Creek Ranch, while near Williams Lake you can learn about the Shuswap nation at the Xat’sull Heritage Village. Visit the historic town of Barkerville, a gold rush town where life in the 1800’s is recreated. With so many lakes in this region, there are big opportunities for canoeing and fishing, like the 12-lake canoe chain at Moose Valley Provincial Park, and some of the best fly fishing in North America at Little Fort. The city of Prince George is the major center in this part of BC. Visit the artists’ community of McBride, where you can not only go heli-skiing in winter, but heli-hiking in summer. Two major provincial parks in the area are Mount Robson and Wells Gray. Mount Robson is the highest peak in the Rockies and the park is largely an undisturbed wilderness. It is also the headwaters of the Fraser River and features the Berg Glacier. Wells Gray Provincial Park is known in particular for Helmcken Falls, one of Canada’s highest water falls which you can enjoy from the Helmcken Falls Rim Trail. On your way back to Kamloops turn off to check out the all-season resort at Sun Peaks. Explore the southern BC Coast by taking the Coastal Circle Route. The first of four ferry rides on this route takes you from Vancouver to Victoria on Vancouver Island. Make sure you buy the Circle Route ticket at your first ferry. On the way to Victoria stop in Sidney by the Sea, “book town BC”, and then plan to enjoy the famous Butchart Gardens. Victoria highlights include the Royal BC Museum, the inner harbor, and whale watching trips for orcas and humpback whales. 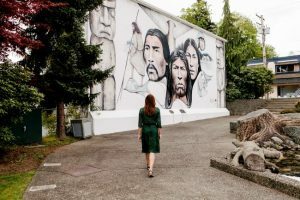 Driving up the east coast of the Island you’ll come to one of BC’s newest wine regions in the Cowichan Valley, the “City of Totems” in Duncan, and the world’s largest outdoor murals gallery in Chemainus. Explore Nanaimo’s waterfront and grab some lunch at the Dinghy Dock pub, a floating pub in the harbor. Your second ferry ride will take you back to mainland BC, to Powell River on the Sunshine Coast, where you’ll want to catch a movie at the Patricia Theatre, the oldest, continuously operating movie theatre in the country. A side trip to Lund brings you to Desolation Sound, considered some of the world’s best cruising waters, and yes, you can take a cruise here. Your third and fourth ferry rides will take you down the Sunshine Coast back to Vancouver. Along the way plan to check out the Skookumchuk Narrows near Earl’s Cove for spectacular tide changes, and follow the Purple Banner Route for the many artist studios you’ll find here on the Coast. Wherever you chose to go on your summer driving vacation, find our BC Bed & Breakfasts as your preferred accommodations. Your hosts will be able to give you even more information about what’s special in their area. And wherever you go, enjoy beautiful British Columbia!